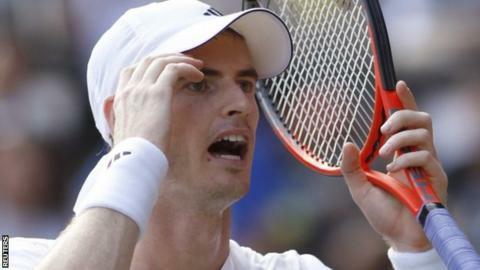 Andy Murray squandered two match points as he lost his Japan Open semi-final to Milos Raonic in three sets. Raonic broke the defending champion to love in the opening game of the match as he recorded the biggest win of his career 6-3 6-7 (5-7) 7-6 (7-4). The Canadian, 23, engineered a second break to win the first set and battled back from 4-1 down to take the decider. Raonic will play Kei Nishikori in the final after the Japanese player beat Marcos Baghdatis 6-2 6-2. The number eight seed broke his Cypriot opponent twice in each set as he raced to victory in just 61 minutes to become the first Japanese player to reach the final. The defeat by Raonic was only Murray's third since he was beaten in the Wimbledon final by Roger Federer. Since then, he has won gold at the London Olympics and became a grand slam champion for the first time with victory at the US Open in September. His run in New York included a straight-sets win over Raonic, but Murray's earlier prediction that his latest meeting with the world number 14 world be "much tougher" proved to be correct. "I hit my passing shots very well in New York (beating Raonic in three sets), but today I don't think I passed him well, so he came to the net more," said Murray. "I played better in the second and third sets, but I was obviously disappointed not to close the match up. He played better on one or two points." Raonic backing up his opening-game break with some solid serving as he sent down five aces in the first set. Murray saved three break points in the second set before winning it with a cross-court backhand in the tie-break and he opened up a 3-1 lead in the third with his first break of the match. However, Raonic, who had saved a match point against Janko Tipsarevic in his quarter-final, broke back in game seven and then smashed his way out of trouble at 30-40 and 5-6 down. A double fault gifted Murray a second match point but the British number one was unable to take advantage as Raonic took the deciding set into a tie-break with a terrific low volley. He then won two points on Murray's serve before wrapping up the match on the second of his three match points. "He played well behind his first serve," added world number three Murray. "That made it tough for me. There was always going to be a bit of residue from the last few months."